With Damon Albarn and Noel Gallagher apparently friendly now, and both looking past their old bands to other projects, the way is clear for Pulp to receive their due. The most dapper and acerbic band of the Britpop era is on a reunion jaunt that will take it through New York’s Radio City Music Hall tonight and tomorrow, en route to Coachella and a couple of other West Coast gigs. 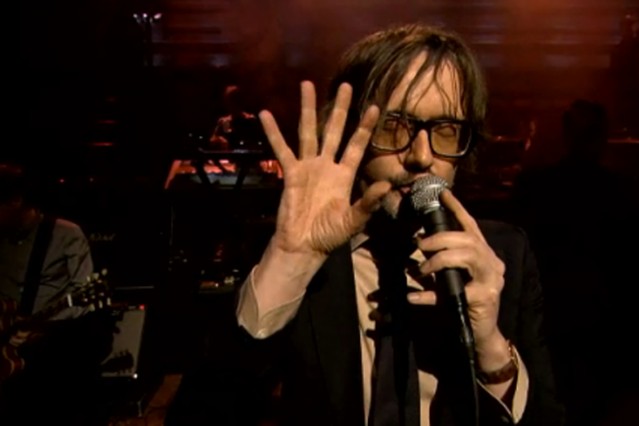 But first, Jarvis Cocker and the rest of the group stopped by Late Night With Jimmy Fallon yesterday. It was a welcome return. In the televised broadcast, Pulp triumphantly romped their way through the band’s landmark “Common People,” originally from 1995’s Different Class, with Cocker — wearing his signature suit, tie, and specs, hair slightly bedraggled — cavorting about onstage like a well-rehearsed teenager. Then, as an online exclusive, Pulp slowed it down for a squalling rendition of “Like a Friend,” which appears on the soundtrack to Children of Men director Alfonso Cuarón’s 1998 Gwyneth Paltrow-Ethan Hawke widely meh-ed movie adaptation of Great Expectations. “I’ll come running just to do it again,” Cocker declares on the Bowie-esque glam-rocker, which doubles as a wonderfully dry, self-lacerating acknowledgement of the group’s reformation. Let’s hope they stay together for the kids.